As I noted yesterday, Mondays are a particularly hectic day around here because it is usually my busiest day of the week for work. Since I start working at 5:30 AM, sometimes Monday run until 5 PM, not leaving me much time to plan for dinner or anything else for that matter. That is why usually on Mondays I try to find a recipe I can put together rather easily and in under an hour, preferably even in under 30 or 40 minutes if possible. I am usually too tired by that point to go all out for a big meal so something simple often works well. This week I decided to take a turn out using some of the chicken thighs I had on and tried out this recipe I got from CafeDelites.com. The original recipe is for a lime and garlic barbecue chicken salad, but I decided to adopt it and make it my own and turn it into a chicken dish without the salad component. In a large bowl whisk together the barbecue sauce, olive oil, soy sauce, Worcestershire sauce, garlic and lime juice. Add the chicken thighs to the marinade and toss the chicken thighs to make sure they are coated well and evenly. Allow the chicken to marinade at room temperature for about 15 minutes. Heat a large oven-safe skillet or cast-iron pan over medium heat. Add a drizzle of olive oil to the pan and heat until the oil is smoking. Add the marinated chicken thighs to the pan, along with any excess marinade, and cook the chicken until it is browned on each side, about 4 to 5 minutes per side. Add the pineapple to the pan, reduce the heat to low, and cover the pan, cooking the chicken until it is cooked through, about 15 to 20 minutes, turning the chicken about halfway through the cooking process, and the pineapple is nicely caramelized. 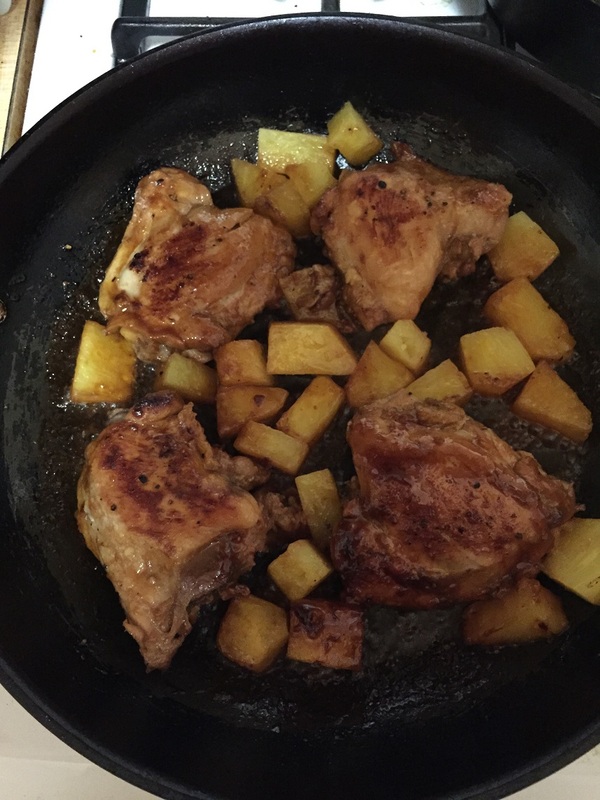 remove the chicken and pineapple from the pan to a large platter and serve. You get all kinds of great flavor to the chicken from the marinade, including the nice combination of the lime juice with the soy sauce, but I really liked what the pineapple brings to the dish most of all. You get the great sweetness of the pineapple throughout he dish and it seems to go very well overall with the chicken. I served this very simply with some rice and some fresh green beans and it made a great meal. You could use any chicken pieces that you like with the marinade – drumsticks, wings, breasts or boneless breasts – and I think it would turn out just as well, you would just have to adjust your cooking times accordingly for the pieces that you were using.